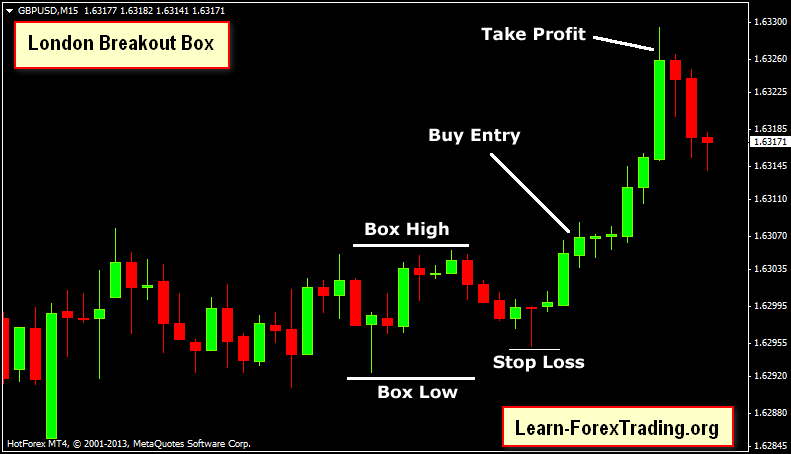 Londom Breakout Box is an intraday trading system, this is an other classic strategy. London Breakout Box method takes advantage of the London open session. Draw the box, wait for the breakout and then set your stop-loss and profit target accordingly. There is no need to keep monitoring your charts. Currency pairs: USD/JPY, GBP/USD, EUR/USD, USD/CHF. At London open, draw a box enclosing the high and low price of the previous 2 hours. (8 x 15 min candles). Wait for a 15 min candlestick to close above the high of the box. Place your stop loss below the previous swing low. Price Objective: Risk-to-reward 1:2 (i.e. risking 25 pips to make 50). Wait for a 15 min candlestick to close below the low of the box. Place your stop loss above the previous swing lhigh. Profit Target( 50 pips GBP/USD, 40 Pips EUR USD, USD/CHF, 45 pips USD/JPY, 30 pips AUD/USD). In the example GBP USD 15 min chart.